This is a real pleasure to announce that my first work for the Bureau of Investigative Journalism is now live (click on the image). The Naming the Dead project is part of the large investigation originally led by Alice Ross, and now by Abigail Fielding-Smith, and Jack Serle. 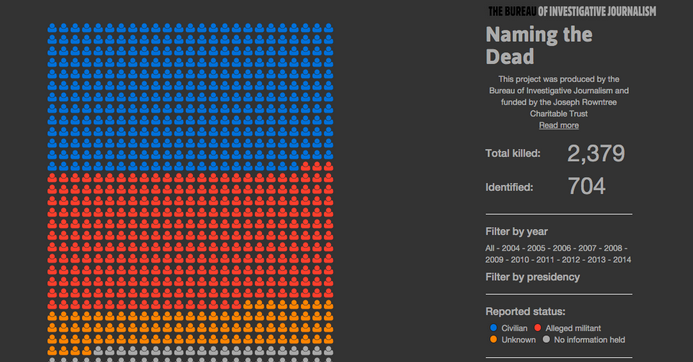 Naming the Dead is a sub-project which aims to identify the victims killed by US drones strikes in the Middle-East. And to put as many names and stories as possible on these persons. The study and monitoring are very thorough, and hopefully such clarity and precision will inspire other journalists to get in touch to collaborate on stories, or offer background on the whole drones campaign. The visualisation is built with the excellent and almighty d3.js library. It relies on the Naming the Dead dataset, converted to JSON for use with d3. One tiny SVG icon is appended to the HTML document for every person present in the dataset. With some d3 magic, the person's data is bound to each individual SVG icon - allowing us to query it a bit later, when the user clicks on it for example. 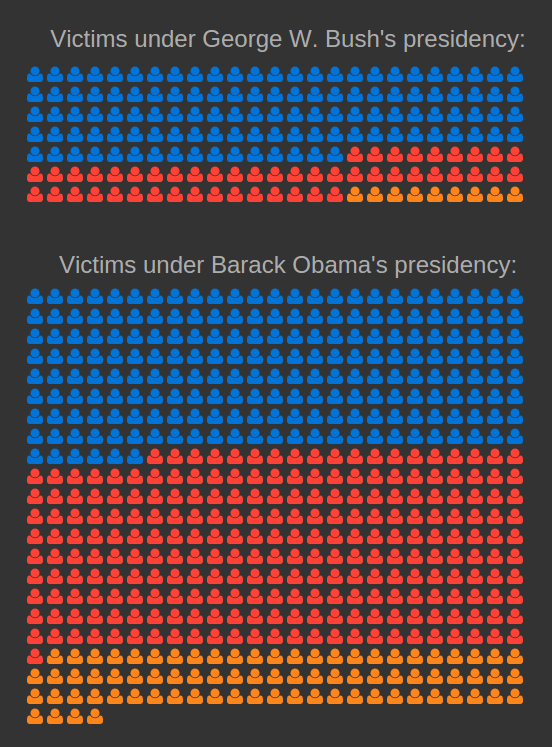 The colours depend on the person's reported status, and you sure have noticed the big lot of grey ones at the bottom: they represent the total of persons allegedly killed by the United States during the drones campaign for who we do not have a name or information - yet. Because we do not have information about them, they are not in the Naming the Dead dataset, but their presence in the graphics is essential! So, I appended them manually, with some information extracted from the largest Drones investigation dataset. I will leave you to your conclusions regarding the meaning to give to this graphical representation. The dataset will be expanded with Jack and the Bureau reporters' researches. Make sure you follow the Naming the Dead website and Twitter account @NamingTheDead.